Don’t worry – Jar Jar won’t be making an appearance. But this pump quirk is probably just as scary… or annoying. I treated an awful 46 mg/dl at around 5:30 am with a crap ton of juice and a graham cracker. I didn’t offer a bolus for the extra snack because I was exhausted and just didn’t care at that point. I’d just deal with it in morning. I didn’t have my transmitter on, so I wanted to take advantage of this uninterrupted sleep for the next couple hours. I woke up about an hour and a half later because the cats were going crazy. I figured then would be a good time to check again and assess the damage. 192 mg/dl. Not great, but not horrible. Especially for a BG in the 40s. I go to administer a correction for the 192, which should have popped up a 2 unit correction bolus, at least. It told me to administer .7 units. What? It also told me that I had 1.3 units already in my system. WHAT? 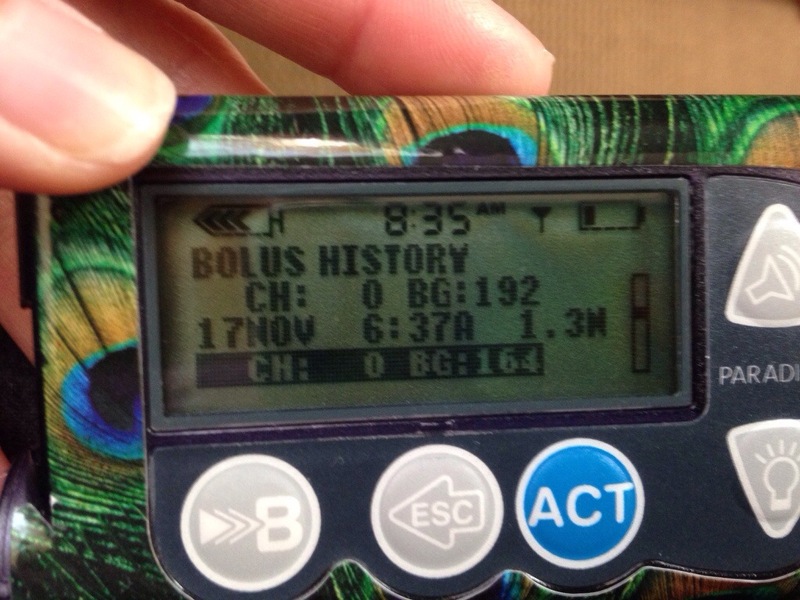 So about an hour after my low, I administered a 1.3 unit bolus for a blood sugar of 164. Which I don’t have record of on my meter. And 164 is a pretty specific blood sugar, so it’s not like I was like oh – I accidentally rolled over onto my bolus button and hit the up arrows. I would have physically had to enter that number in. Did I just sleep bolus? Did this randomly just show up on my history? Why would I still be 192 a half hour later? So I did something even more stupid and gave another unit of insulin because I was convinced that I didn’t actually get the full correction that I needed. And apparently, I didn’t because I woke up about 2.5 hours later with a BG of 99. Excellent. 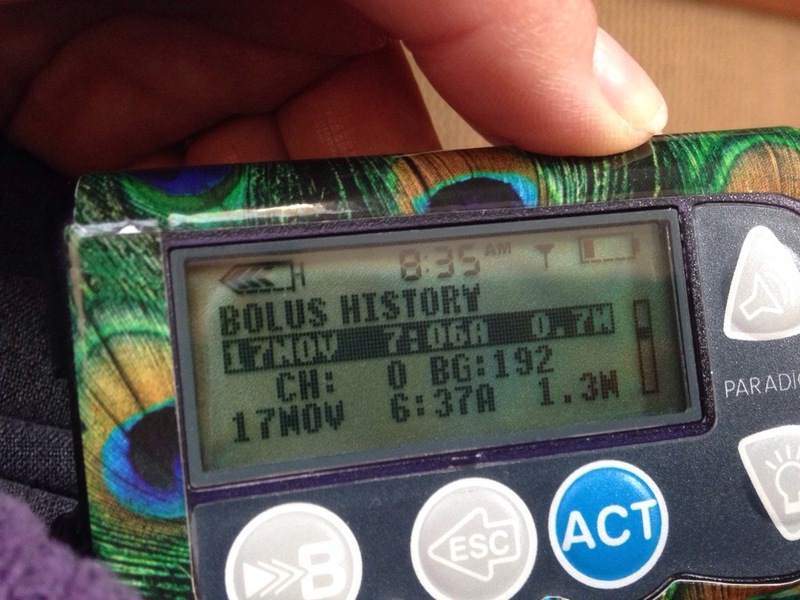 That is quite the enigma….are you known to sleep bolus? I don’t *think* I’ve ever done that, (or done a drunk bolus, either), but I guess there’s always a first time for anything! 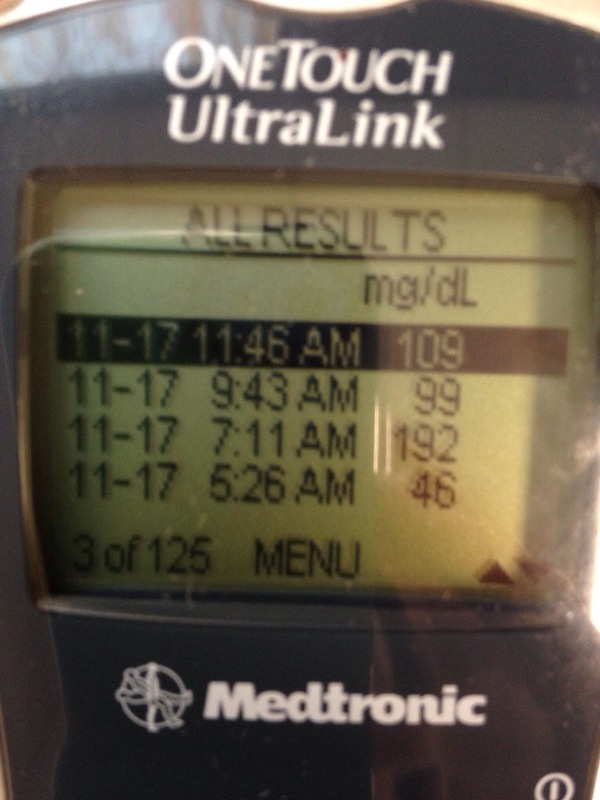 Hmm… I had a phantom overnight bolus once — woke up with a low to discover that I had bolused for 40 carbs overnight for no reason whatsoever (http://wp.me/p2aBl3-BM). Shortly after I wrote that, I found another blogger, with the same type of pump, who encountered the same thing. I’m not blaming the pump — I don’t have the evidence to do so. It’s very possible that I *did* bolus in my sleep (I do have diabetes in my dreams, and operating the pump is second-nature to me), but this is now the third such case I’ve heard — one being my own. Hmm…. It’s pert near a year later from all your posts … but have the 530G now and it happened to me today. It never happened with the Paradigm Revel. Was not asleep, was not in a sugar low. Tonight – recording the data in numbers(since the computer updates are ‘required’ and Medtronic updates lag a bit) noticed a phantom bolus of 7.7 units earlier this morning. The BG reading was higher, not lower after that. So this is case #4.